The official campaign period in Korea (at least for local elections) is only about two weeks, so it makes little sense for candidates to invest in billboards and the like. Instead you will see banners draped across buildings in high traffic areas. You will also see trucks decked out with the face and slogan of the local candidate. I saw this truck yesterday near my place. 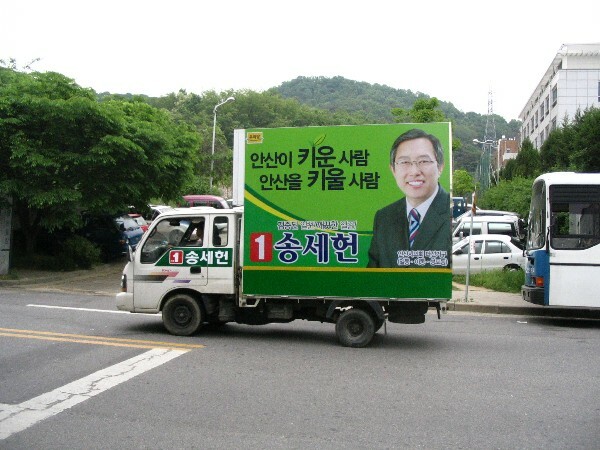 It is for Song Se-hyun (at least that is how I think he spells his name), a candidate for Ansan city council. If you look carefully in the upper left-hand corner, you can see that Song is running under the Uri party banner. I hope to get a few more campaign pics up next week.